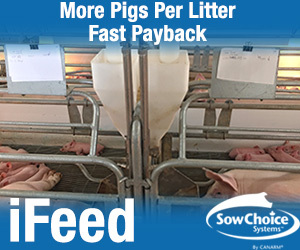 The Swine Health Information Centre reports a holding time of 78 days will sufficiently reduce the risk of certain contaminated feed ingredients exposing swine to disease causing bacteria or viruses. 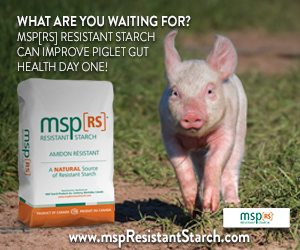 To help minimize the risk of diseases being spread to pigs through their feed the Swine Health Information Centre has been looking at holding times for feed ingredients. Swine Health Information Center Executive Director Dr. Paul Sundberg explains scientists have calculated the half life of Seneca Valley Virus A, a surrogate for Foot and Mouth Disease, and the virus that showed the longest half life of all that were tested, including African Swine Fever. Based on that half life calculation that research showed that 99 percent of any viral contamination would be neutralized if the product is held for 78 days after a born on date or after manufacture and seal. Those products that I’m talking about there are amino acids, vitamins and minerals. If it takes 50 days of transport over the water then the holding time in the U.S. would be another 28 days total, so that’s 78 days after a born on date. That’s the way that that’s applied. We’ve got that going on. We’re currently doing additional research at South Dakota State University to do a better job of calculating half life, a more rigorous experiment for half life. That is expected to be completed by middle of December. I expect that by the first of January we will have a new communication about the results of that research with a different calculation of holding time. So that 78 days is interim until we learn more but we think that that’s going to be sufficient to help decrease risk.